Litter for rats is used to absorb urine and feces, often in a litter box in the corner of the cage, but can also be placed as a substrate across the bottom of the cage, and some rats will gather it up as bedding. The wrong litter can create respiratory and digestive issues, and even cause your rat to lose an appendage. Making your own ensures that the ingredients are suitable and safe. Whether torn by hand or put through a home office shredding machine, shredded paper is soft, absorbent, and creates very little dust. It's also a good way to recycle junk mail, phone books and used copy paper. Newspaper is also suitable for rats with dark fur, but the ink may discolor light-colored rats. Avoid glossy paper since it is not absorbent. Rolls of toilet tissue and paper towels serve a dual purpose since your rat can use them for both litter and bedding. On top of that, you don't necessarily have to do the shredding yourself. Place a partial roll in the cage and let your rat have fun tearing it into pieces. If you are completely changing out the litter, however, you might need to start the process by shredding enough to line the bottom of the litter box until your rat tears up enough to meet his needs. Hay is natural, inexpensive and a little goes a long way. All you have to do is pull it apart and fluff it up to line the litter box. Your rat may pull a little out to enjoy as a snack as well. 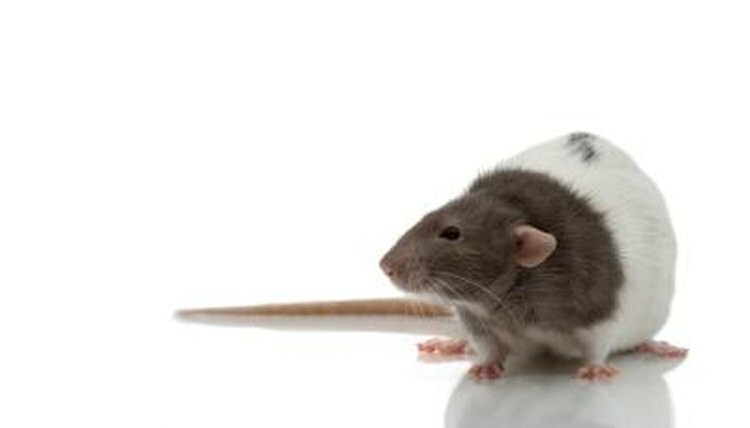 The disadvantages are that it can be messy, dusty and have a wet grass odor when your rat urinates. Grass hays, like Bermuda and timothy are softer and produce less dust and odor than legume hay like alfalfa. Like toilet tissue and paper towels, cloth can serve both as litter and bedding, and you can do the shredding or let your rat take care of the majority of the work. If you're up for a little extra cleaning, cloth litter can also be washed and reused. Use fabrics that don't produce long threads or unravel when shredded, such as fleece or microfiber. Long threads can get wrapped around your rat's paws, tail or neck and injure him. Many types of wood chips are unsuitable as litter for your rat, but hardwoods like aspen, oak or ash are safe because they do not produce noxious fumes. If you have a wood chipper or access to one, a single hardwood log will produce a large pile of litter. Hardwood litter is inexpensive if you can obtain a single split piece of firewood and is easy to produce in large quantities, but it can be dusty and messy. Pine, cedar, spruce and aromatic soft woods are dangerous to rats. They give off fumes that cause wheezing, and cedar can also cause liver damage. Cotton floss sold as bedding and litter for small animals is also dangerous because it can get caught on appendages and restrict blood flow. Clay cat litter, whether clumping or not, is also unsuitable for your rat due to the large amount of dust it contains and the fact that it can cause a blockage if ingested.